It looks like the talk of Tau Empire coming later this year has gotten tongues wagging. Here’s the latest for you Battlesuit fanatics! Tau Empire Release Info– New updated XV-?? battlesuit / Commander-battlesuit combo kit. – New kit is strongly based on the current Commander suit, but not identical. – New Kit is designed for much more dynamic assembly & posing options than the current range. Which feeds back into the previous Tau Empire rumors from Steve the Warboss, and the earlier set of Kroot Mercenaries tidbits from last month. 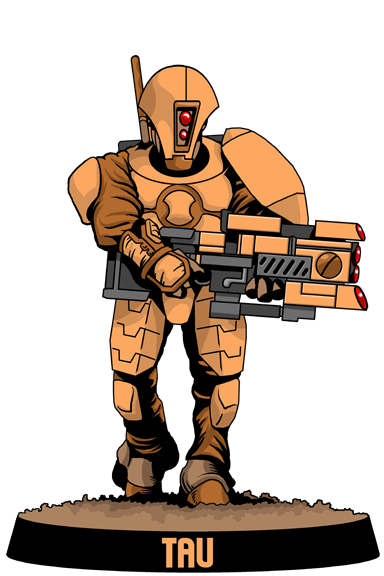 So if you had to design a new suit to help the Tau out, what would it be?